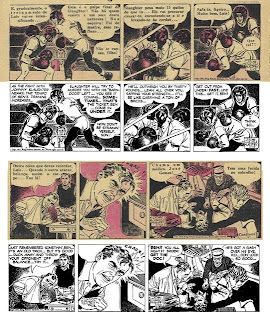 Here's an example of 2 strips (in fact these are posted on the Big Ben Bolt page at http://www.classiccomicspress.com/bolt). Andoni was good enough to provide scans from his collection to show me the difference. Comments, opinions on this matter would be greatly appreciated. Of course we want to give you the best quality book that we can but, as mentioned above, sometimes we have to go with what we have. Thanks for letting us know Charles, it is always the best thing to do, I think. To answer your question, well what is important here is not so much the cutting. As long as these are proofs it should be OK, and they are not cutted much. But, and this is important, is it possible to get better strips or spend some time adding the missing art to the bottom?? You mentioned Rip Kirby. But there is several more aspects in that publishing to consider when we review it, I am afraid what fans are most concerned about is the cutting at the bottom. In other words, are the strips in your book other vice OK?? Do good reprints exist elsewhere, and would it just require a bit more work to make it right?? Is it worth it?? In the end, have you said your books to be "the definitive publishing" and best of what there is?? As I see it you give us honest good books of reasonable good quality, very fit for reading and collecting some "never seen stuff"!! That is the most important, but I would love to see an uncut version. All the daily strips were cut from the bottom during WWII years, up to the beginning of the 50's due to the restrictions of paper. 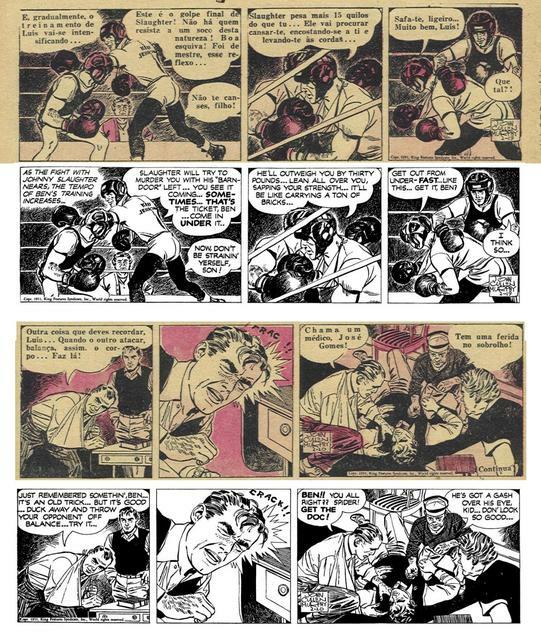 So, it would be desirable that any new edition today would try to find the original art or those newspapers which published the strips in their integrity. Those strips we'd love to see printed again, like the great Johnny Hazard, have never been printed in their full size. And this is one of the cases where the panels suffer more from this cutting. The recent edition of Rip Kirby wa also cut. Strangely enough, the recent Spanish edition wasn't. We can only hope that the incoming editions of this classic comic-strips (Cisco Kid or The Phantom) are published in their full format. may I be so bold (a full-year later) as suggesting that the bottom of the Spanish version shown here was actually drawn by an in-house artist in order for the strip to fit in the format of the paper? it's not the strips that were cut during the WWII years, as far as I understand. it's the format that got shrunk. or am I wrong? on a different note, I just can't wait to get my hands on that Rusty Riley reprints, even though I'd rather wait until you make it right, like you made right anything else you've done so far, some real great job I just wanted to say.